"Math is Power" If you are planning on college for your son or daughter, you want your son or daughter to do well in math. 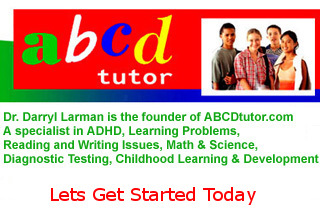 At ABCD Tutor, we build math students! We tutor 1-on-1 in Common Core Math, Basic Math Skills, as well as Algebra 1, Algebra 2, Geometry 1 & 2, Pre-Calculus and Calculus. These subjects are tutored for students in regular classes, as well as advanced AP classes. We guarantee to change math grades This is our promise and we stand behind it! Our math program compares to none. Our methods and materials for teaching math have been developed by Dr. Larman for grades Kindergarten through High School. We offer math help, math homework, math for kids, mathematical formulas, math tutoring, math tables and multiplication tables. Our instructors are not only trained in how to teach mathematics, but we know how to teach the new Common Core Math that most teacher and students are have problems with. Dr. Larman's tutors/instructors are certified and range from math majors, bachelor's degrees, master degrees, Ph.D. and doctor's degrees. Science is the gateway to the future for your child. In an ever evolving business world, science plays a major role in creating new products and services. Give your child the advantage in this technological based future! In science we tutor 1-on-1 in Biology, Chemistry, Physics, Statistics and General Science for all grades levels and AP Advanced Prep Courses.